GAC Pindar in J/V with global freight forwarder TNL International, deliver a 7.6 mt Stamas boat from Georgia USA to Aukland, New Zealand. 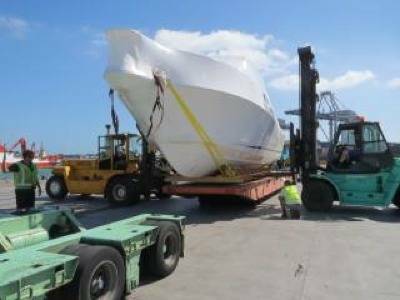 The privately owned motorboat, which is 3.93 metres high and 12.58 metres long overall, was handled with care for its 15,000km voyage. Before being loaded onto a ship bound for Auckland at Savannah, Georgia, it was shrink-wrapped and cradled on a special mafi trailer. Once the craft arrived in New Zealand, TNL GAC Pindar had to make special arrangements for the final stretch of its journey – by road from Auckland Port to its final destination at the dry stack in the city’s Westhaven Marina. The motorboat had to be held in storage at port until it was allowed on its way, as local regulations impose restrictions on how and when such large out-of-gauge objects can be transported by road. By working closely with the port authorities and stevedores TNL GAC Pindar was able to negotiate a waiver of the extra storage fee and successfully deliver the boat. It also took care of all the related customs clearance and taxation procedures. TNL GAC Pindar, headquartered in Auckland, New Zealand, serves Australia, New Zealand and the Pacific Islands, providing a complete package of solutions including yacht transportation, superyacht services, air, sea and road freight, agency services and specialist superyacht bunkering.